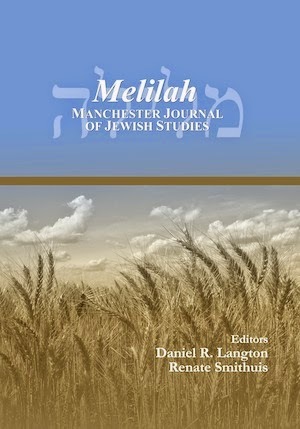 Melilah is an interdisciplinary Open Access journal available in both electronic and printed form and concerned with Jewish law, history, literature, religion, culture and thought in the ancient, medieval and modern eras. It encourages work from younger scholars at the start of their academic careers as well as contributions from established scholars. The title of the journal refers to the ears of corn that are plucked to rub in the hands before the grains can be eaten (Deut. 23:25). Melilah was founded by Edward Robertson and Meir Wallenstein in 1944; the original series is now available online. The journal was relaunched as a New Series in 2004 under the auspices of the Centre for Jewish Studies, University of Manchester. The current editors are Daniel Langton and Renate Smithuis, with assistant editor Simon Mayers. The print version of the journal is published by Gorgias Press. There are known problems with Norton Safe Search and this website, as for many others; please follow the instructions here if you wish to disable it safely.